How to bind xml data to dropdownlist in asp.net - asp net dropdownlist xmldatasource ~ Dot Net Tutorial For Beginner. Asp.net dropdownlist xmldatasource: In this tutorial, I am going to show you "how to bind XML data to dropdownlist in asp.net". Mainly we fetch data from Database but sometimes as per requirement, we want to fetch data from other data source like XML(xmldatasource). Don't worry I am here to tell you how you can bind asp.net dropdown list from the XML file. 1. 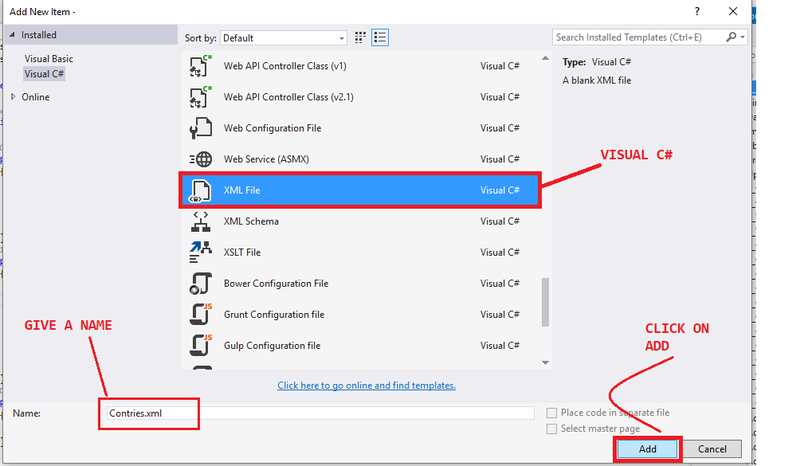 Add XML file (Visual C#). 4. Bind the dropdown with DataValueField and DataTextField. Thanks for reading. If you have any doubt please feel free to comment below.